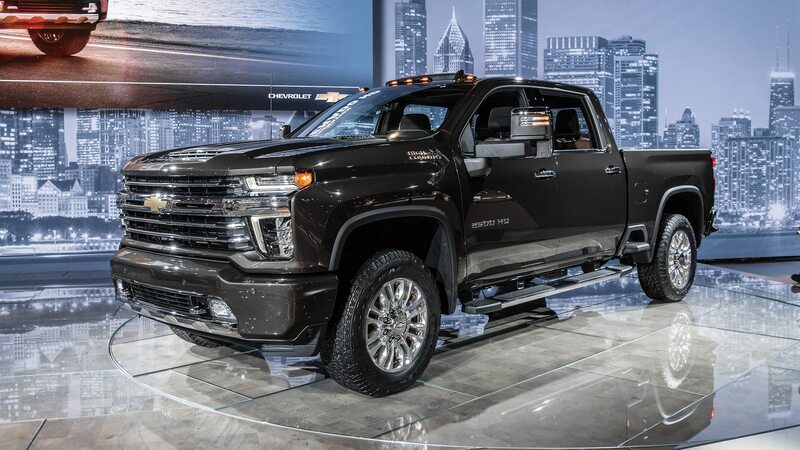 Yet another round of truck-centric one-upmanship. 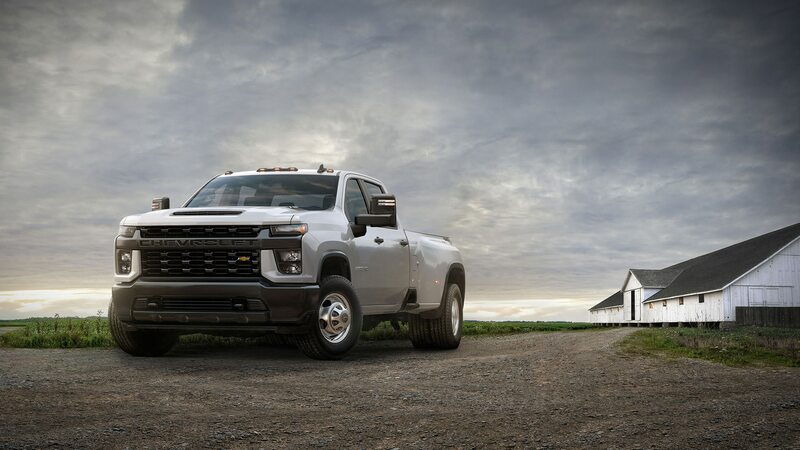 With a grille that would do a Mack truck proud and a claimed best-in-class towing capacity of up to 35,500 pounds, the 2020 Chevrolet Silverado Heavy Duty bowed at the plant in Flint, Michigan where it will be built. 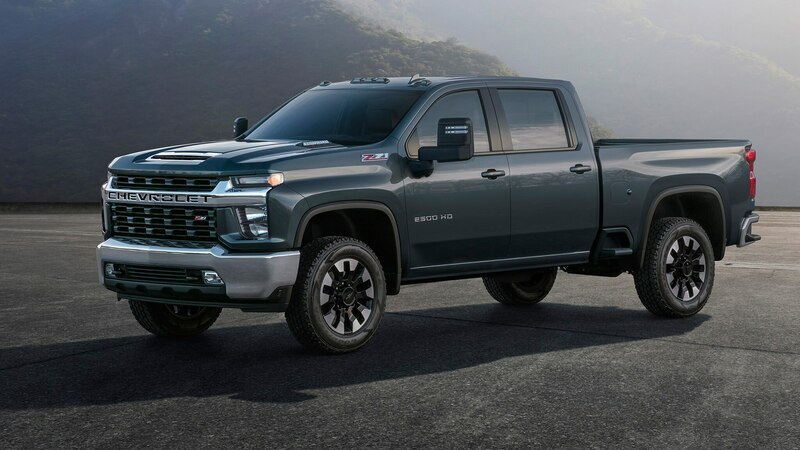 Like the rival Ram Heavy Duty and Ford Super Duty lines, the Silverado HD and its close sibling, the GMC Sierra HD, have targeted big numbers and best-in-class with a fervor usually reserved for Camaro vs. Mustang vs. 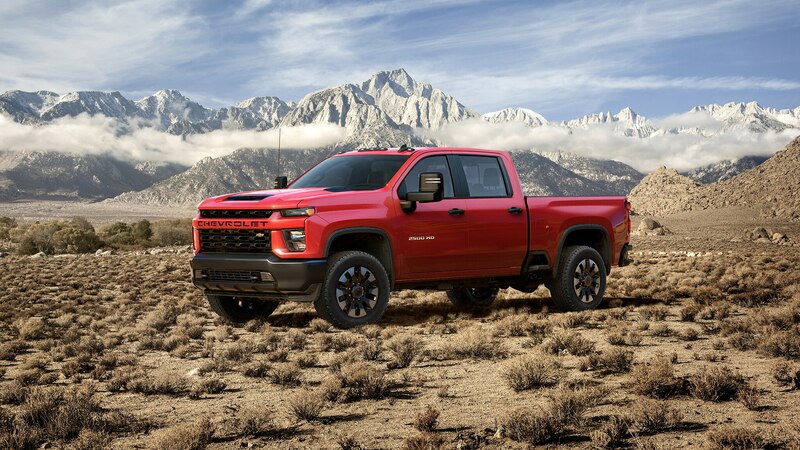 Challenger, only here the profit margins and contribution to the corporate bottom line are exponentially larger and more important. 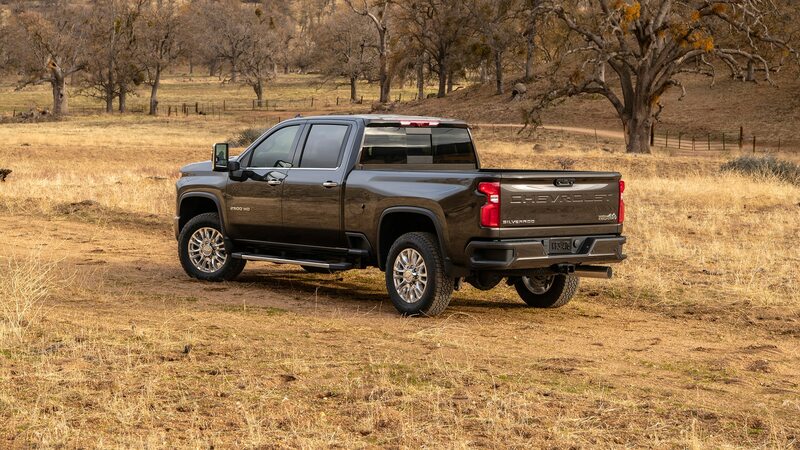 The Chevy Silverado HDs share virtually nothing in design or engineering with the Silverado 1500s, says General Motors president Mark Reuss. 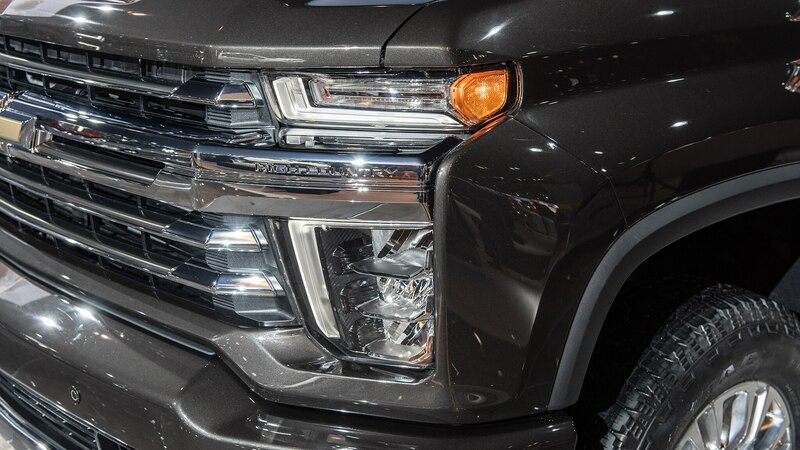 “[These customers] do not want a bigger light-duty. 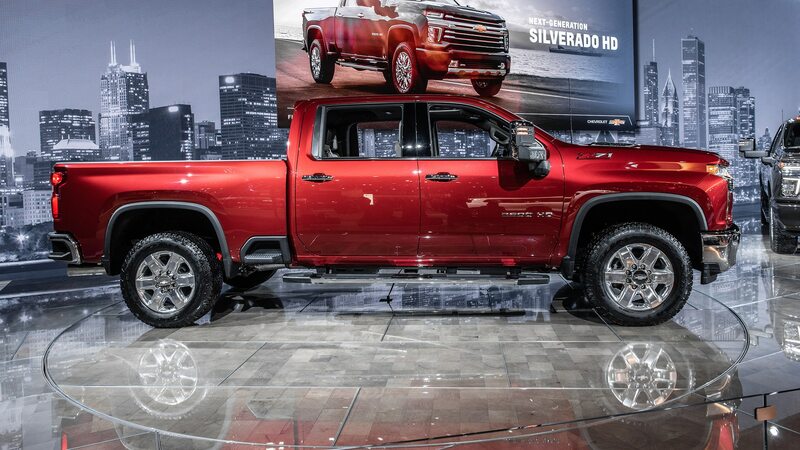 They want a truck scaled to their needs,” he said. 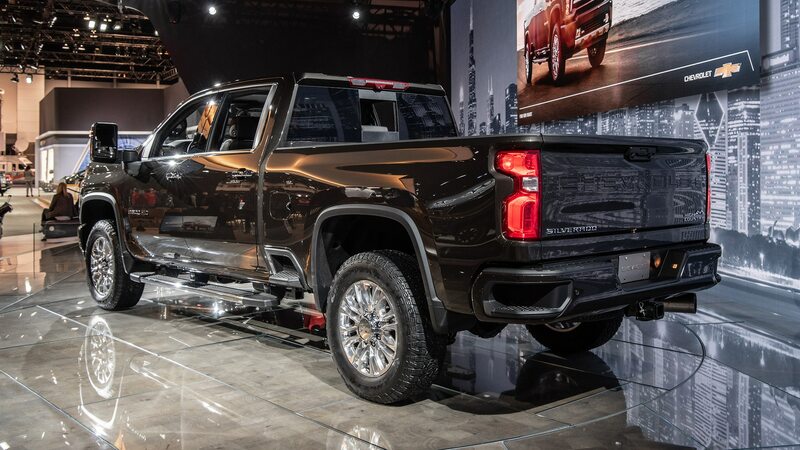 Reuss also acknowledged GM’s recent spate of layoffs as part of the company’s “tough decisions, right decisions” in shifting the automaker into the right direction for future success. 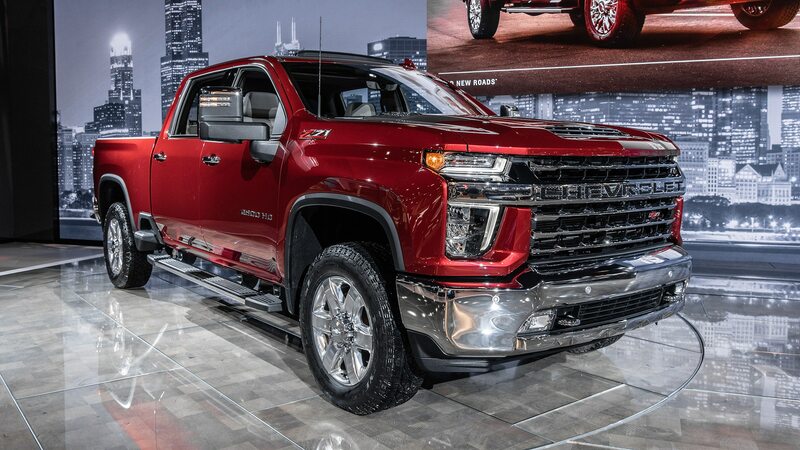 Those layoffs make the timing of the big trucks’ introduction awkward, though Reuss said GM plans to add 1,000 jobs to this Flint Assembly plant, which has more than 3,000 hourly workers on three shifts. 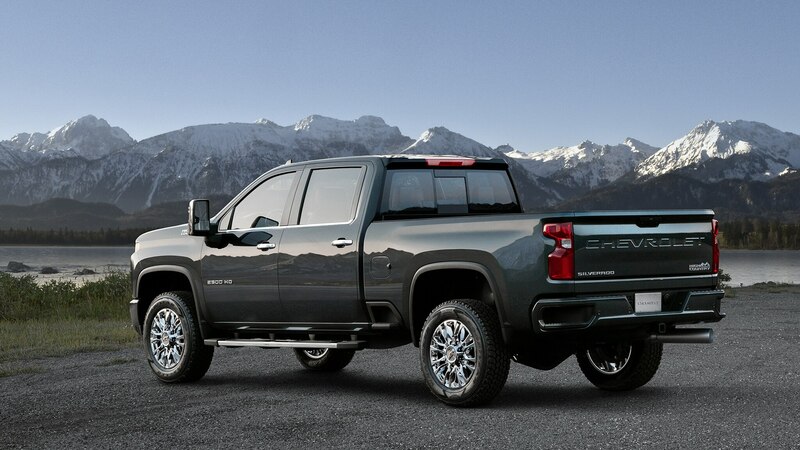 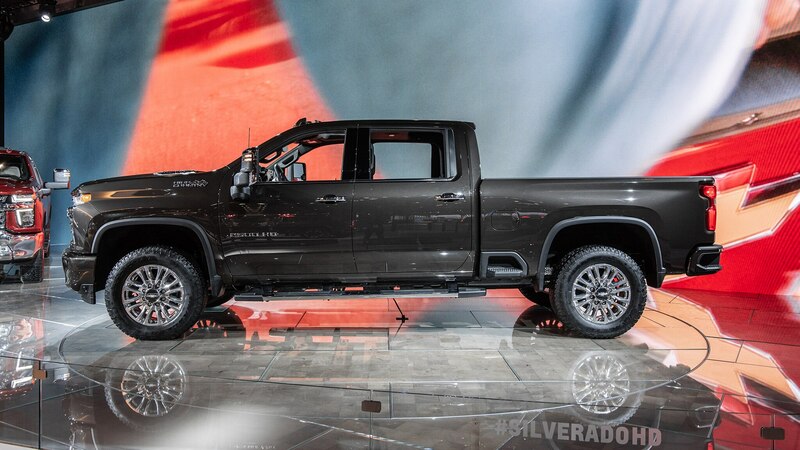 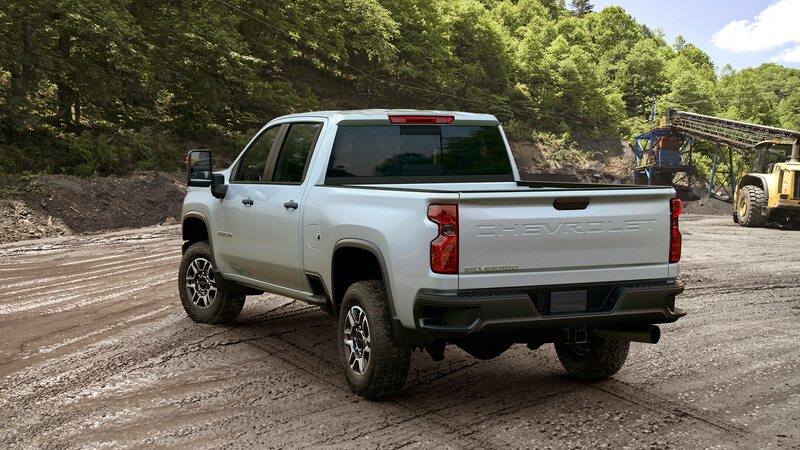 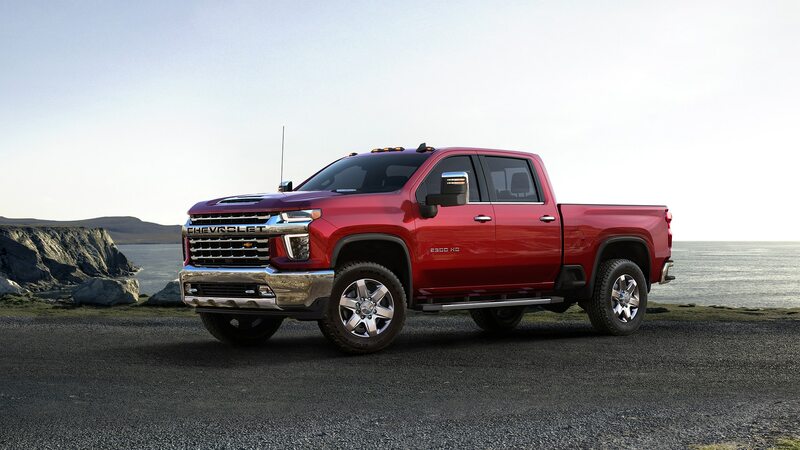 HD and half-ton Silverados share no major parts and components beyond having the same roof panel, and together the heavy- and light-duty Chevrolets and GMCs account for 24 distinct models. 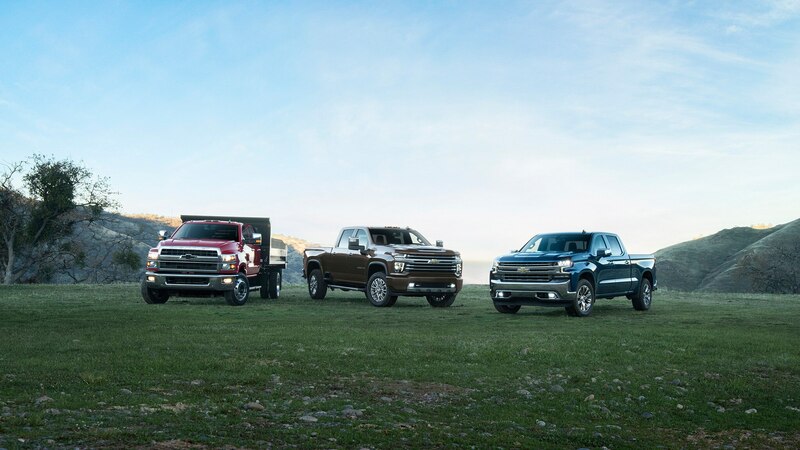 (This does not include the midsize Colorado/Canyon or the new medium-duty trucks.) 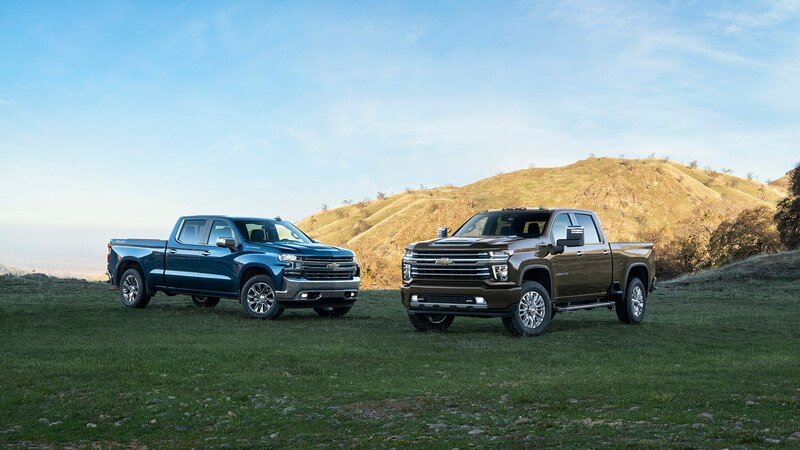 GM trucks have collectively been number one in industry sales, Reuss said, with more than 973,000 sold in 2018, a position it’s likely to lose with the return of the in-demand Ranger to Ford’s lineup. 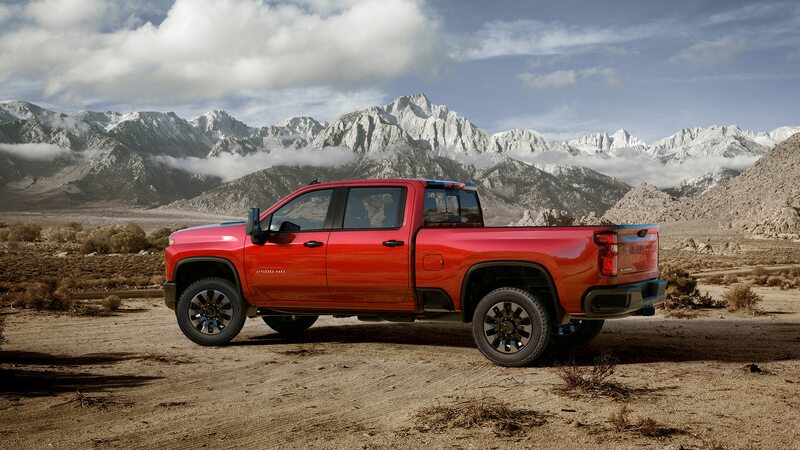 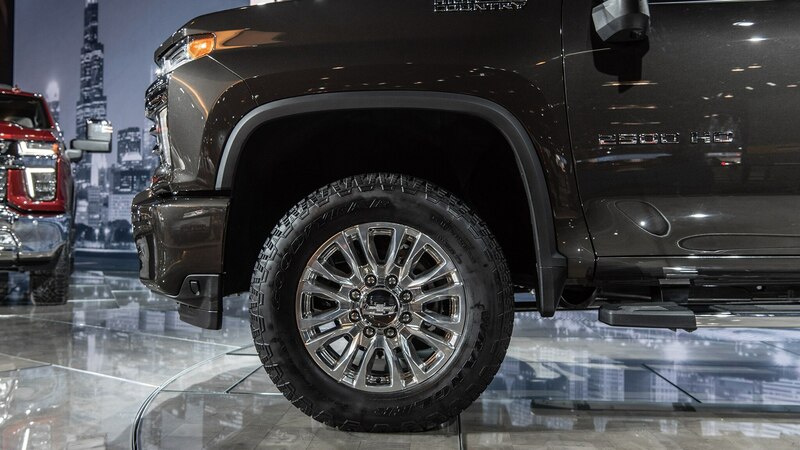 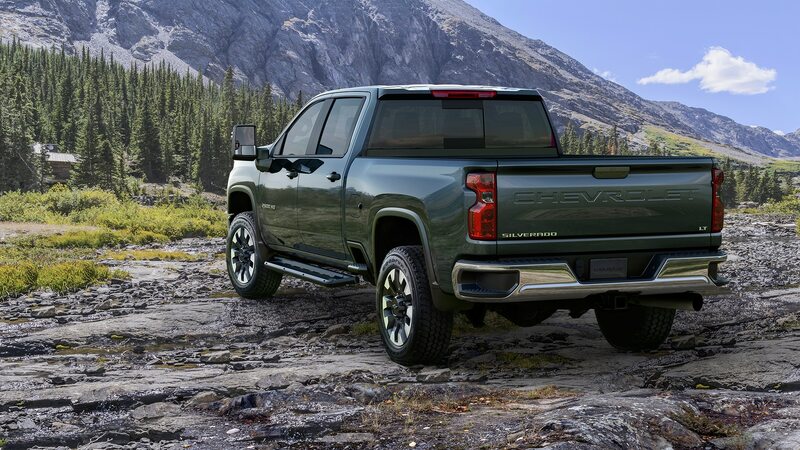 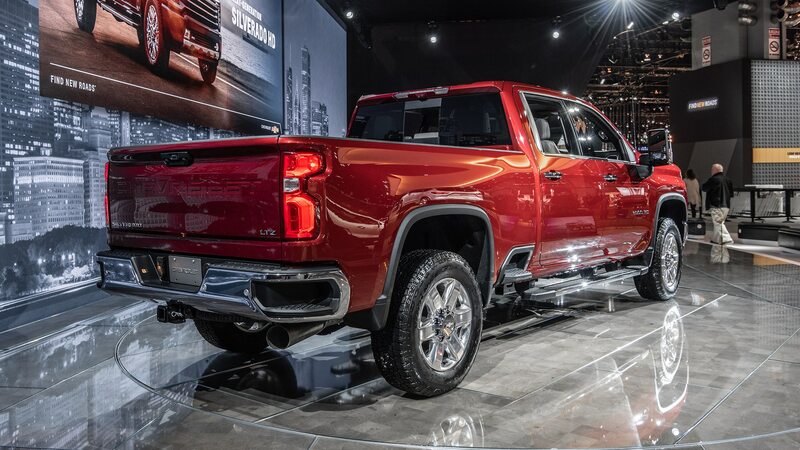 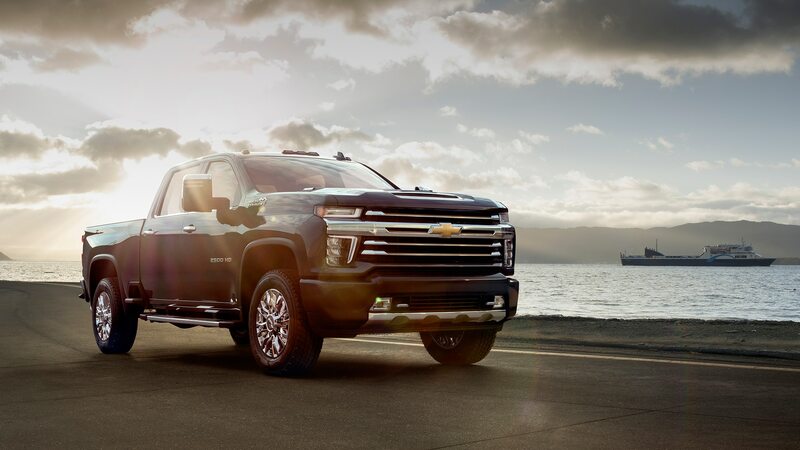 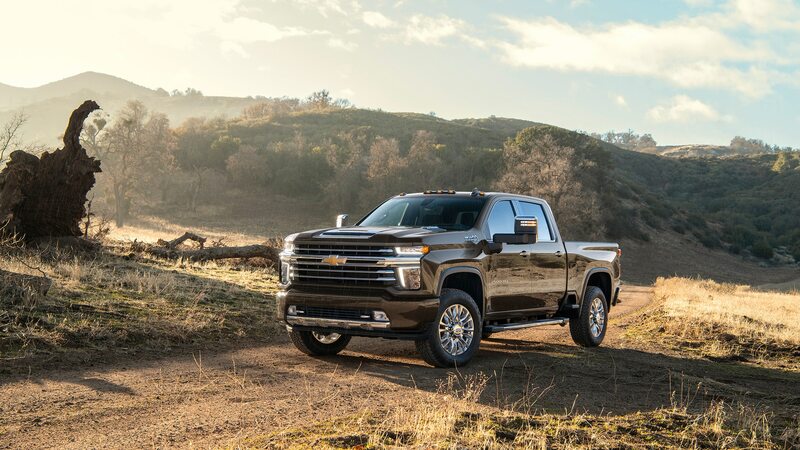 While the half-ton full-size GM pickups adapted mixed-material construction for 2019 in order to cut weight, the HD Silverado sticks with all steel for its ladder frame and body. 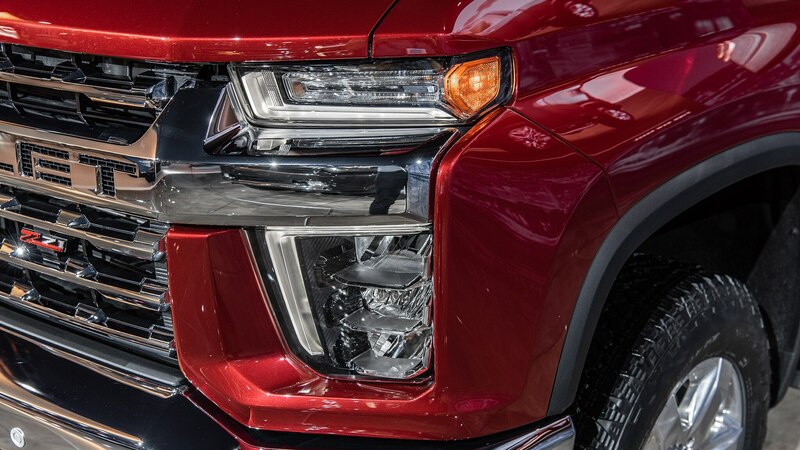 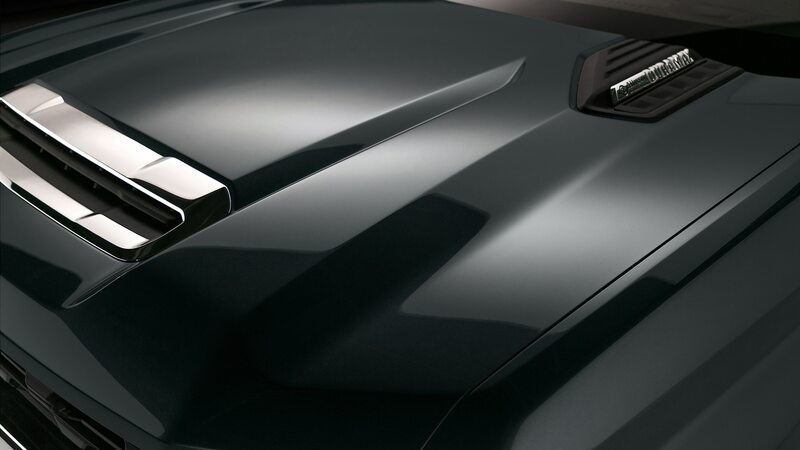 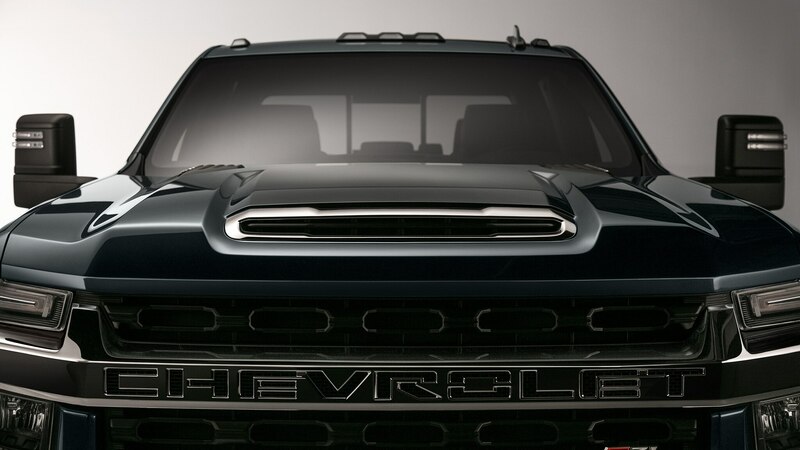 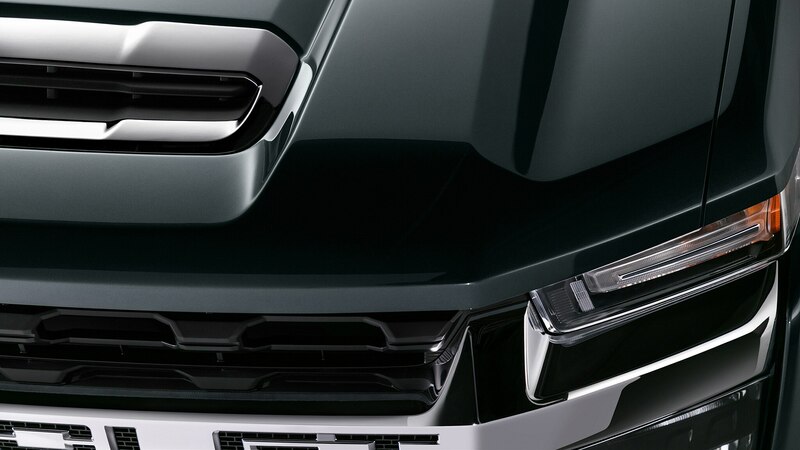 The taller grille and prominent, functional dual hood vents are intended to help cool the engine in diesel versions, said Rich Scheer, exterior design director for Chevrolet trucks. 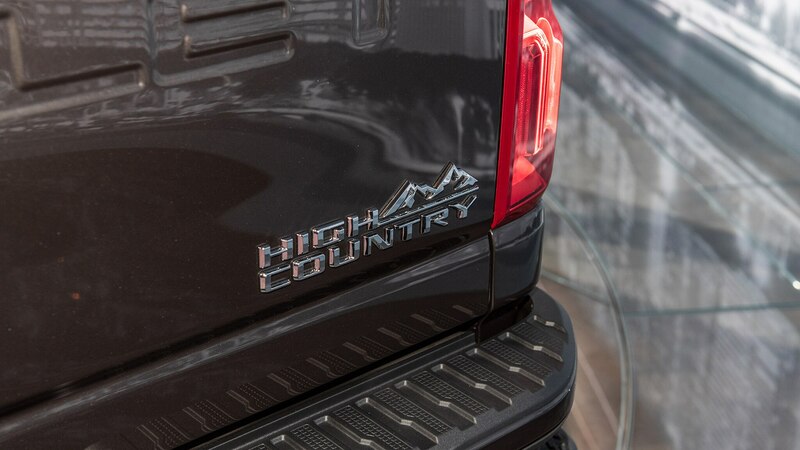 The HDs are wider and taller and the crew cab’s wheelbase is increased by 5.2 inches. 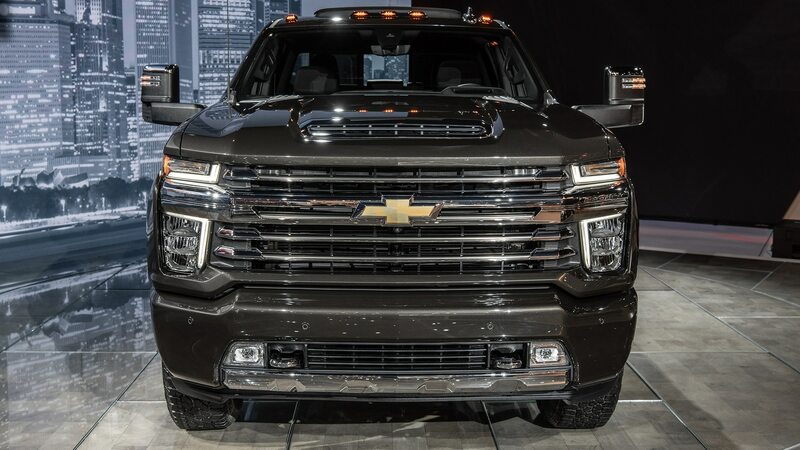 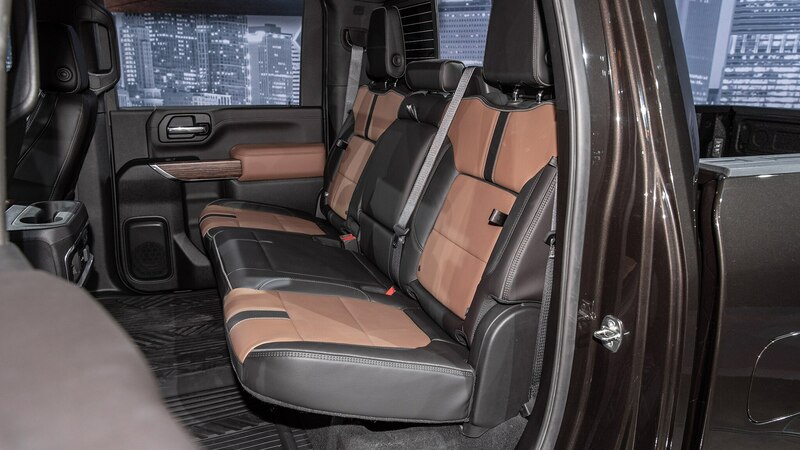 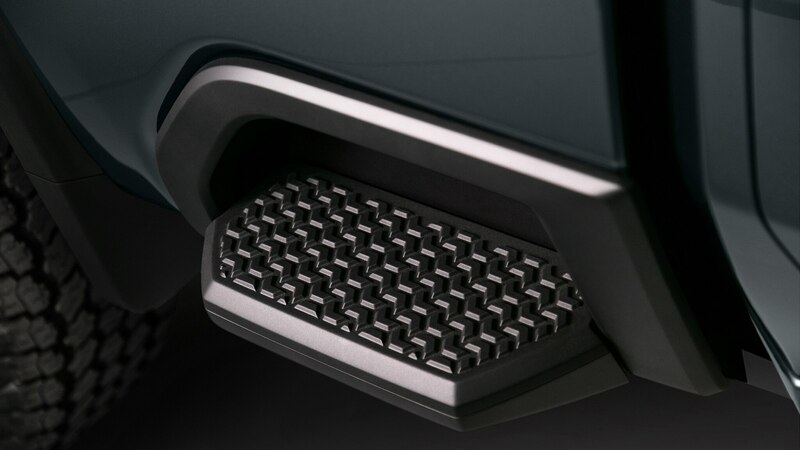 Scheer acknowledged negative reaction on social media to a preview of the Silverado HD’s visage, though the new, techy nose looks better in person than in photos. 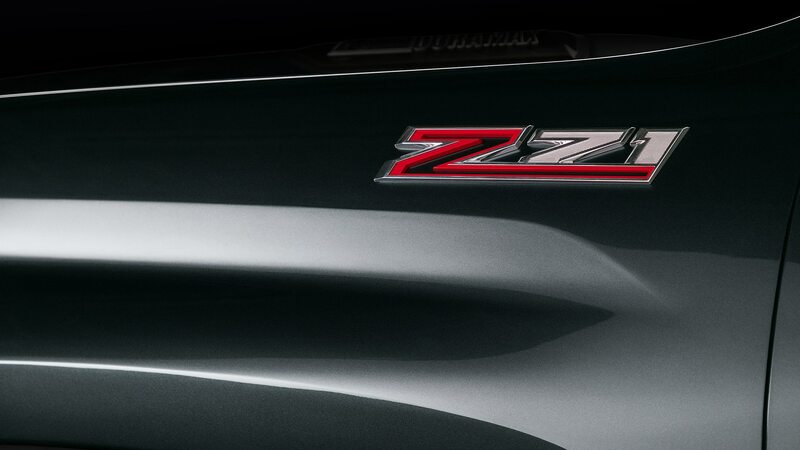 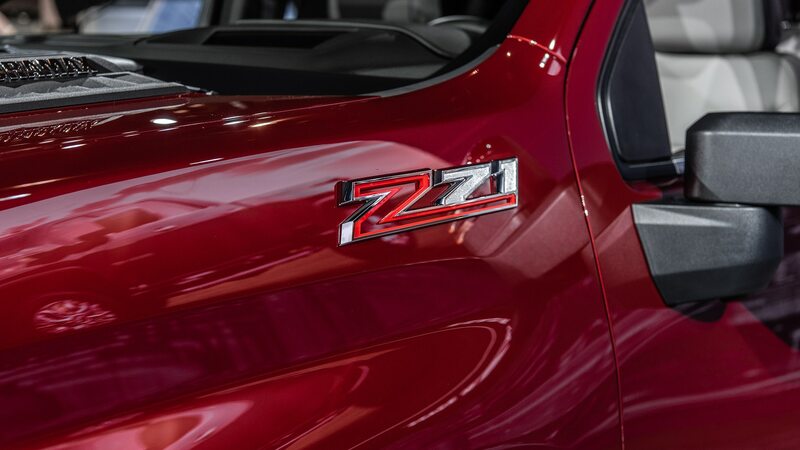 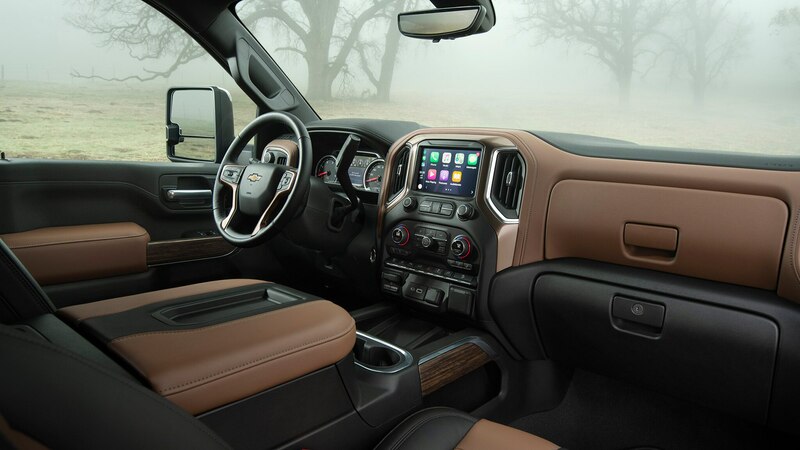 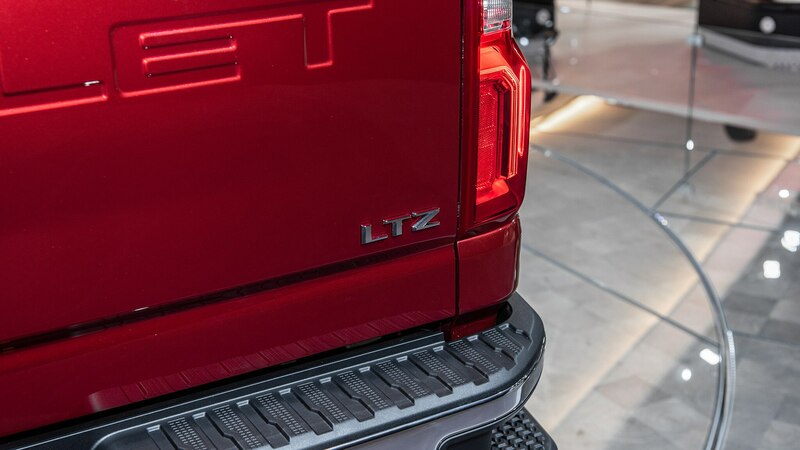 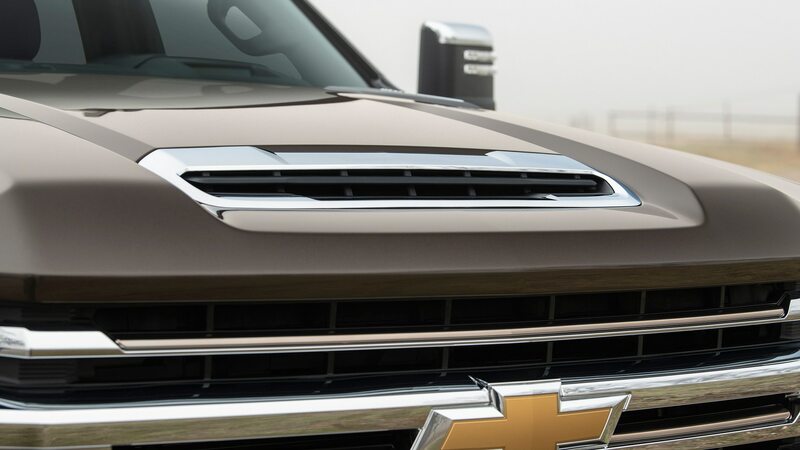 Four of the five trim levels—Work Truck, Custom, LT, and LTZ—feature the CHEVROLET lettering across the horizontal grille bar, while the top-dog High Country replaces the lettering with a gold bowtie. 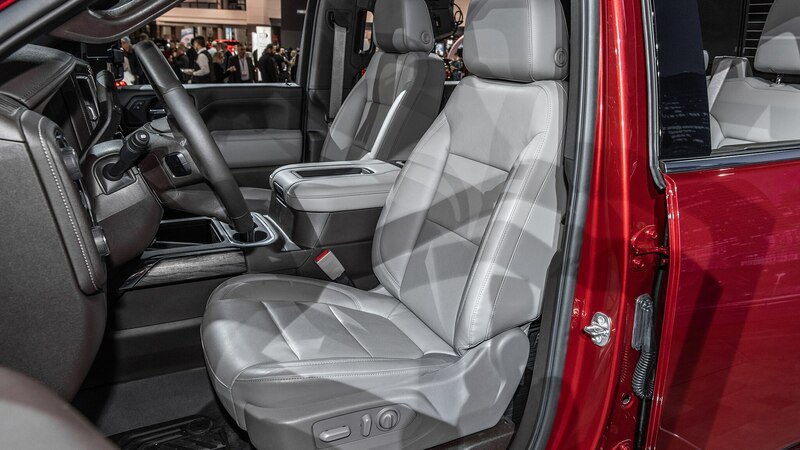 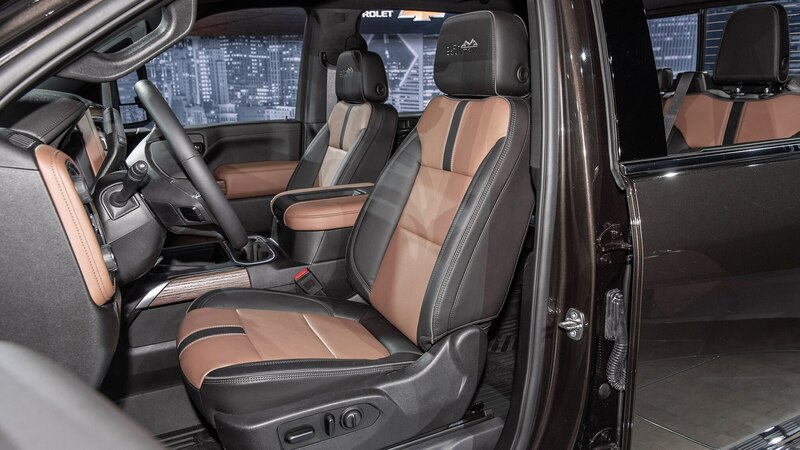 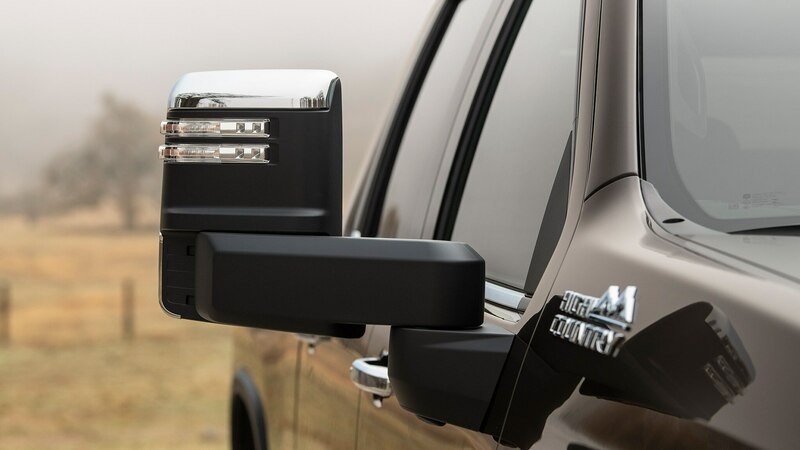 The five trims are available on both the Chevy Silverado 2500 and the 3500 dually models. 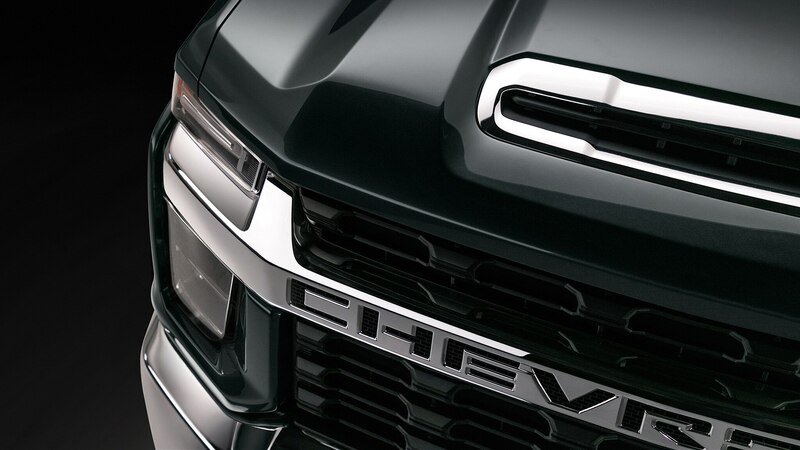 Engine choices are an all-new 6.6-liter V-8 with what Chevy says is first in the HD segment with gas direct-injection. 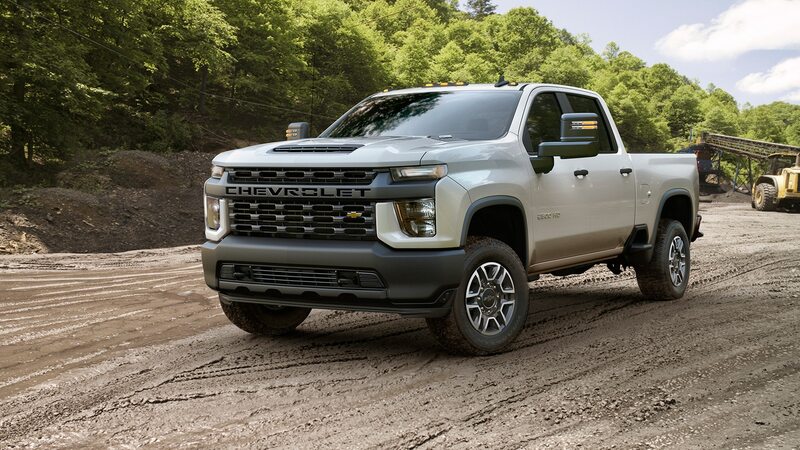 The iron small-block V-8 features a high-compression ratio, Chevy says, and makes 401 horsepower and 464 lb-ft of torque, up from 360 and 380 for the previous gas V-8. 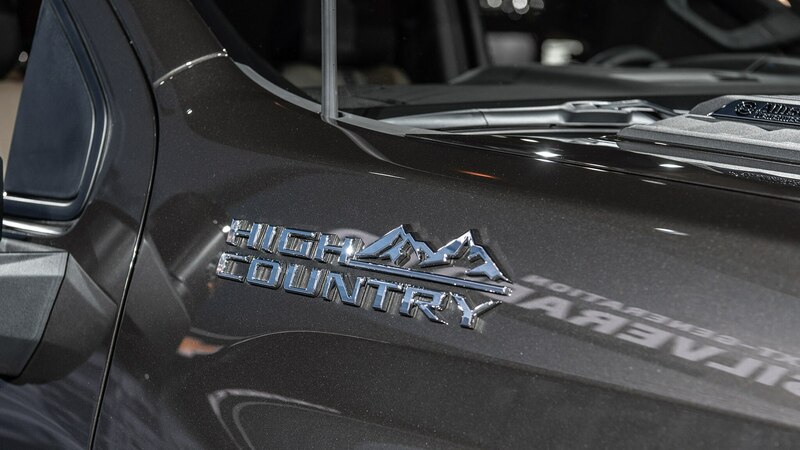 It delivers power through a carryover six-speed automatic transmission. 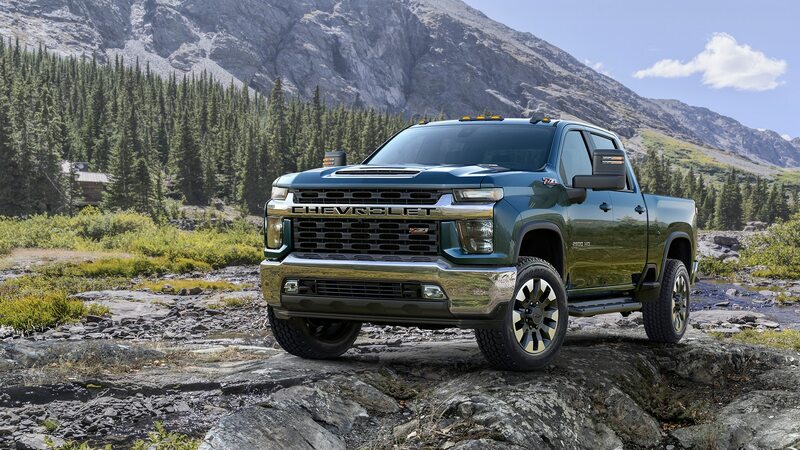 The much more popular engine, the Silverado HD’s 6.6-liter Duramax V-8 diesel, is a heavily upgraded version of the outgoing rig’s. 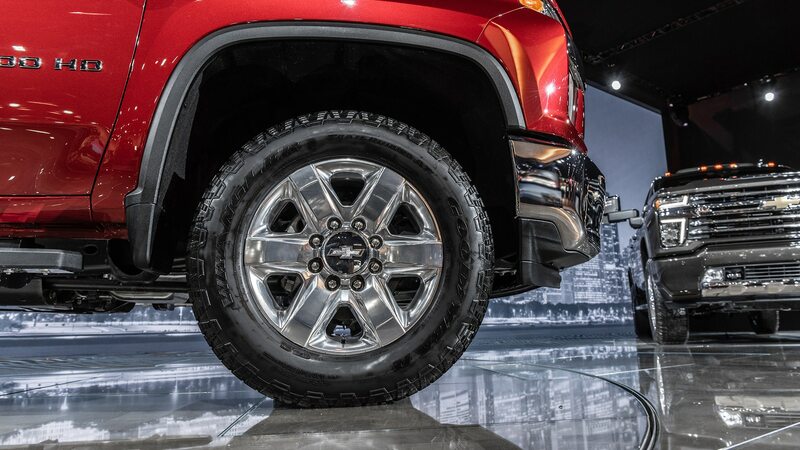 It now has a new 28-inch-diameter fan, up from 25, and its oil cooler has five extra plates for a total of 19. 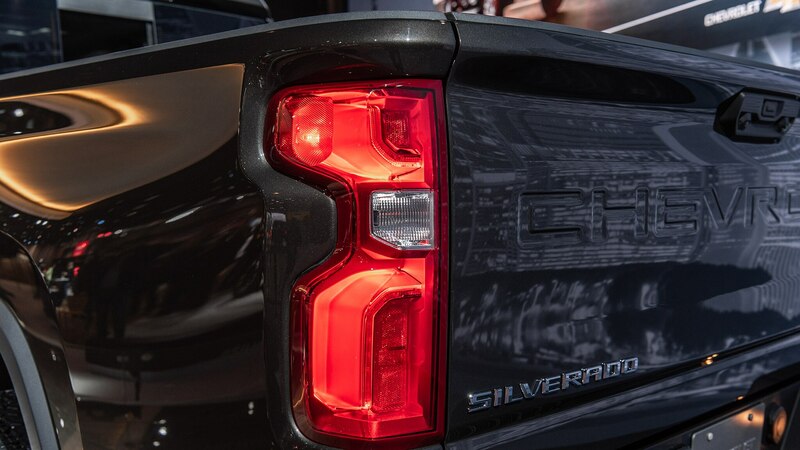 Engine-braking capacity is up 14 percent. 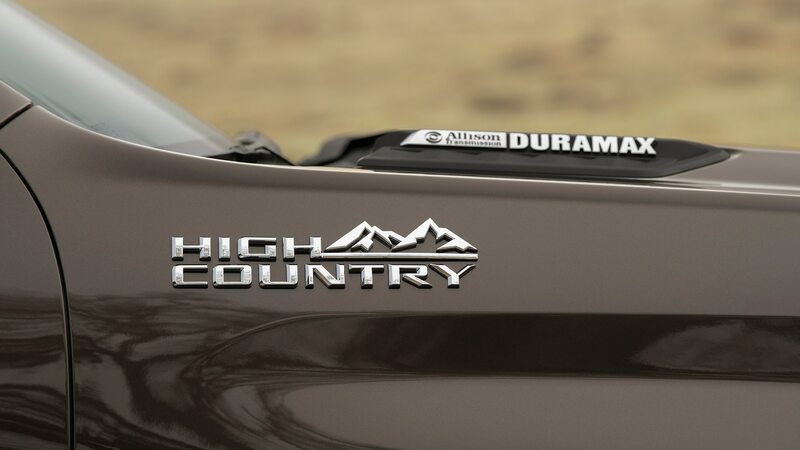 While the Duramax’s 445 horsepower and 910 lb-ft of torque is unchanged, Chevy swipes at the Ram HD’s 1000-lb-ft Cummins diesel by bragging that its diesel can put down all its torque from launch, in first gear. 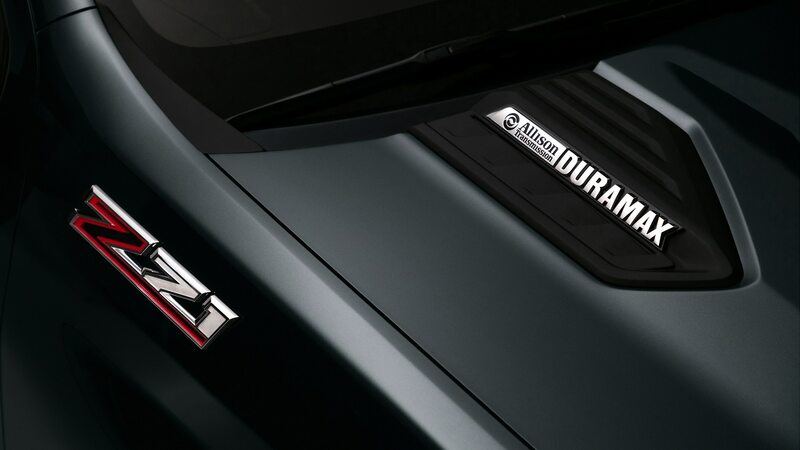 The Duramax is paired with a 10-speed Allison automatic, built by GM. 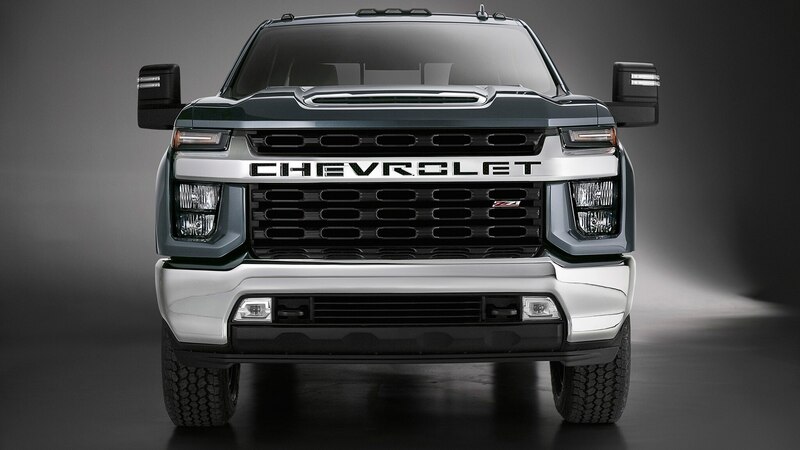 Chevy says it was developed with Allison engineers and validated by the transmission maker, and is on architecture “similar” to the 10-speed automatic that Ford and GM developed together, and which comes with Ford’s freshly updated Super Duty F-series pickups. 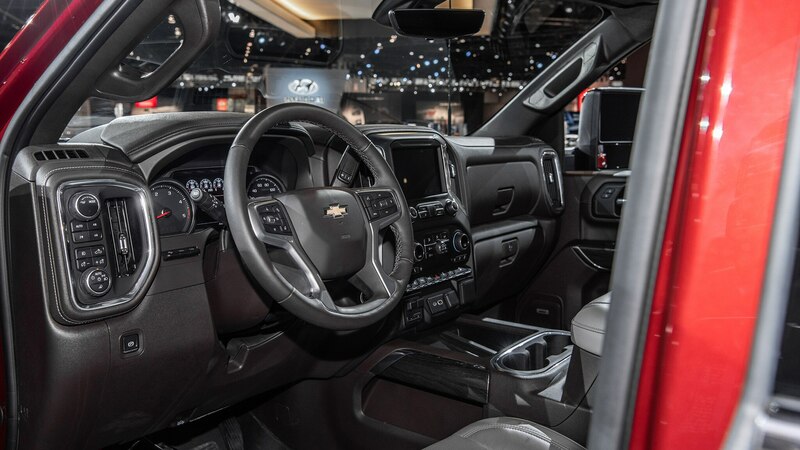 The transmission’s clutches and brakes are the same, but gear ratios are slightly different, according to Chevrolet. 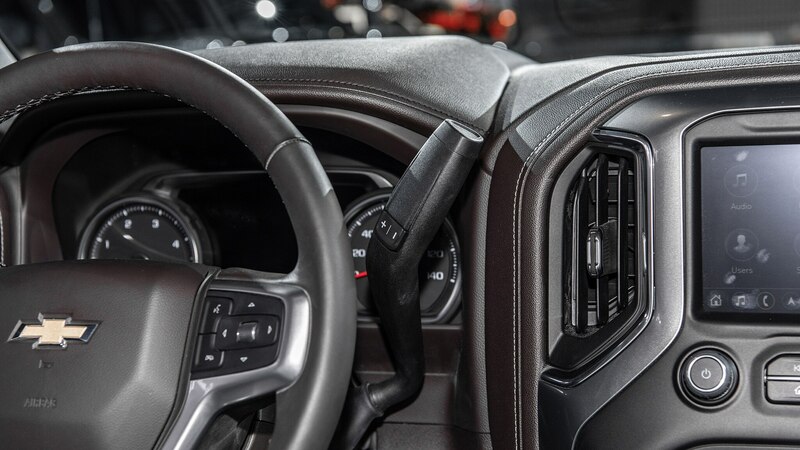 The new gearbox also features an integrated power take-off unit with chain drive, all for quieter operation. 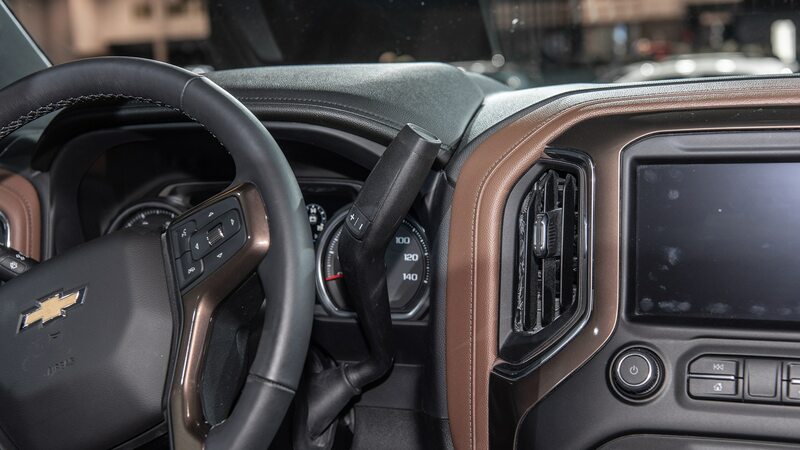 A new Autotrac active two-speed transfer case on 4×4 Silverado HDs electronically controls the 4 Auto mode, for “seamless” shifting between rear-wheel-drive and four-wheel-drive. 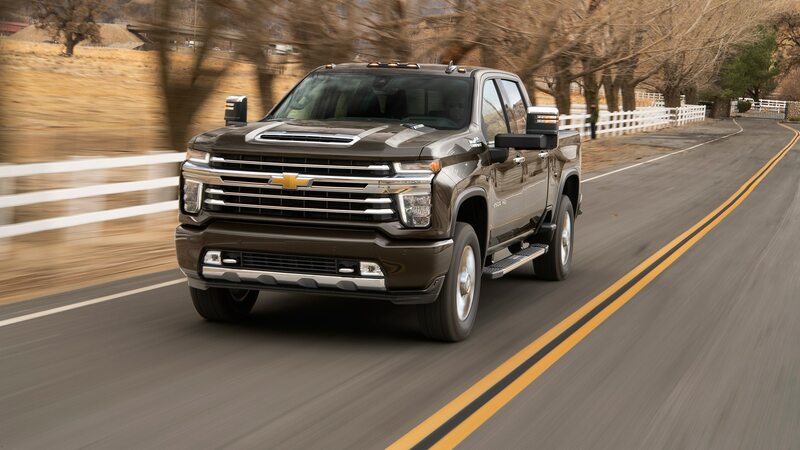 Every Chevy Silverado HD dually has a towing capacity of more than 30,000 pounds, up to the 35,500-pound maximum, which is a 52-percent increase over the outgoing model’s max. 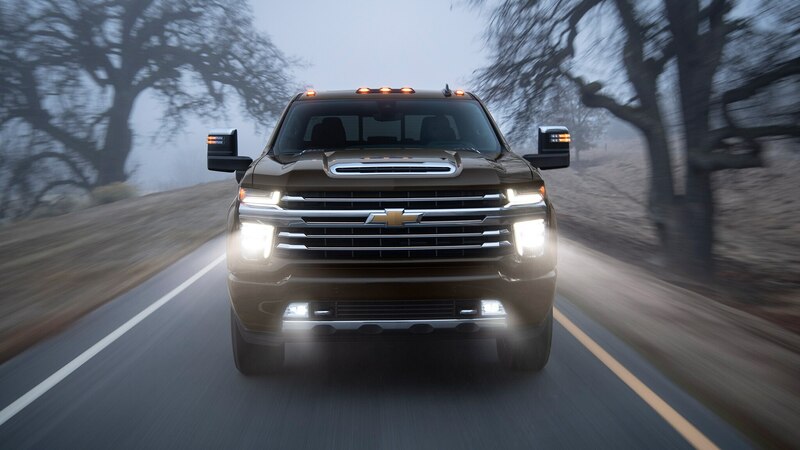 The Silverado 2500 with the gas-powered V-8 has a 17,400-pound towing capacity, up 18 percent. 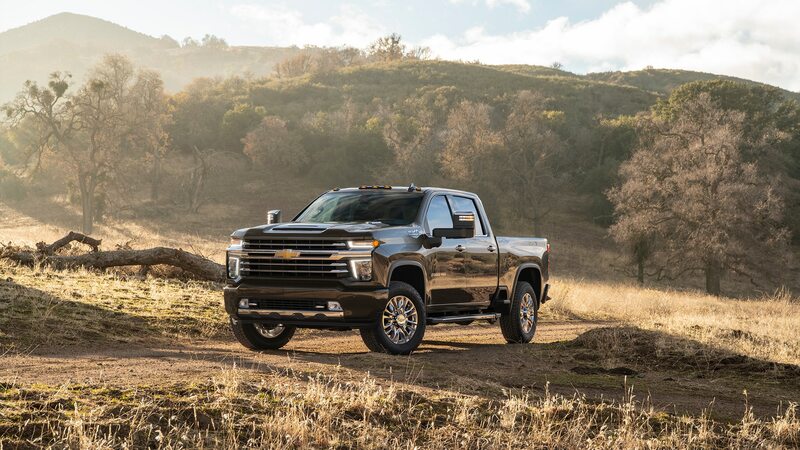 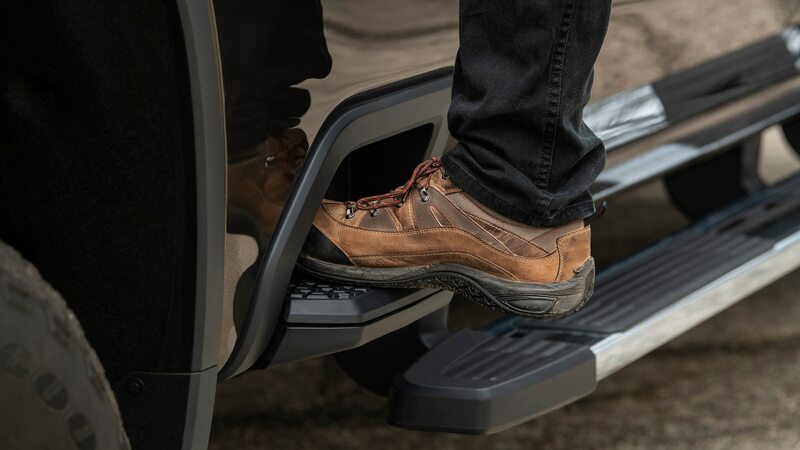 Features on the HD Silverado’s new ladder frame include a one-piece, five-inch prop shaft in place of the old truck’s two-piece, 3.5-inch shaft, for better load distribution. 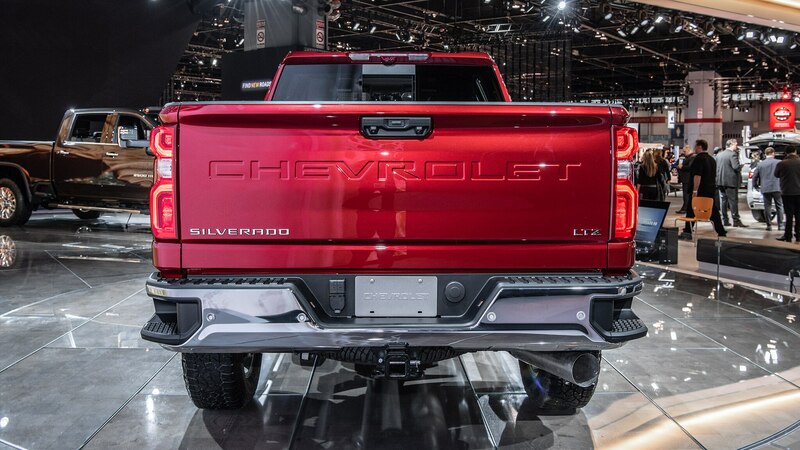 The Silverado 3500 has a new 12-inch rear axle and 12-inch ring gear. 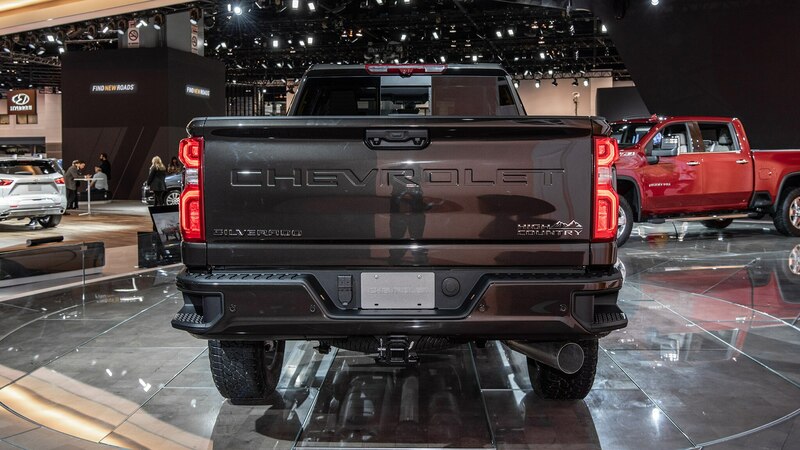 The trucks carry over their double-wishbone front suspensions. 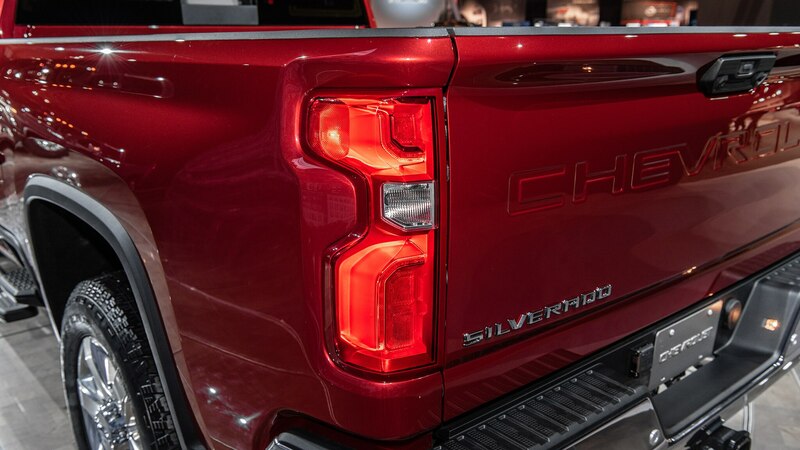 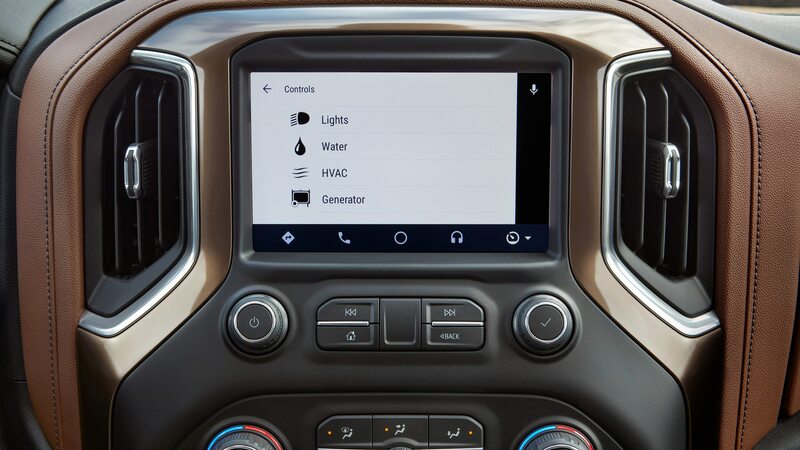 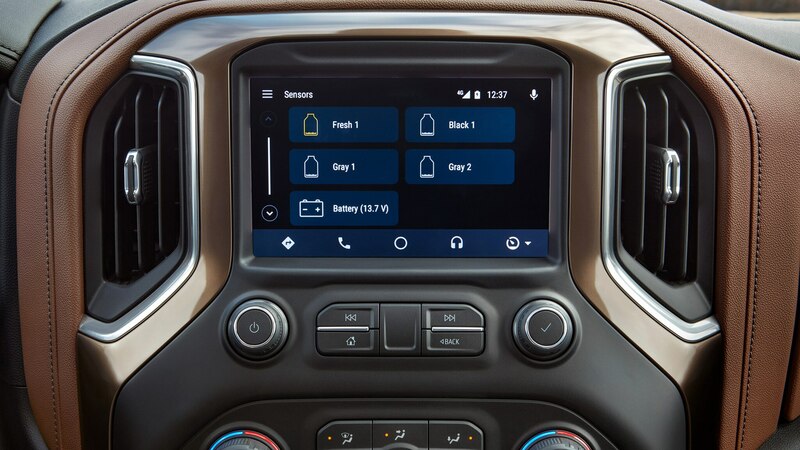 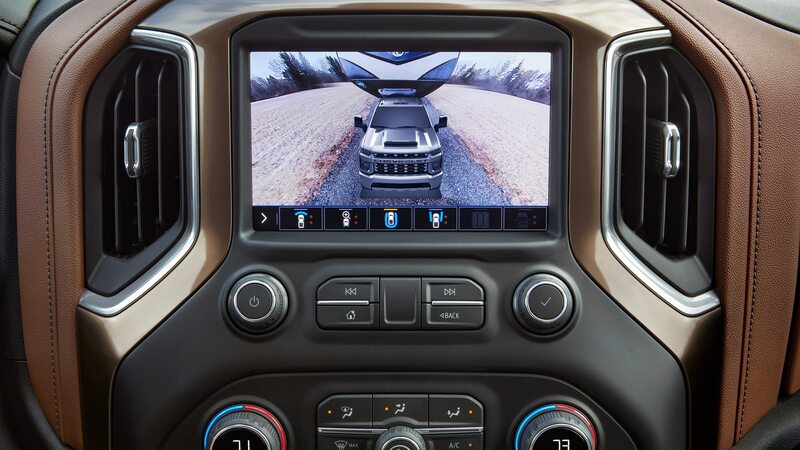 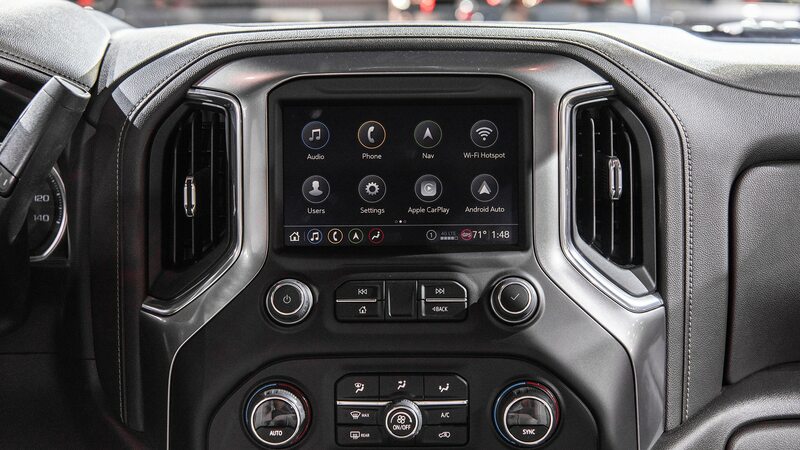 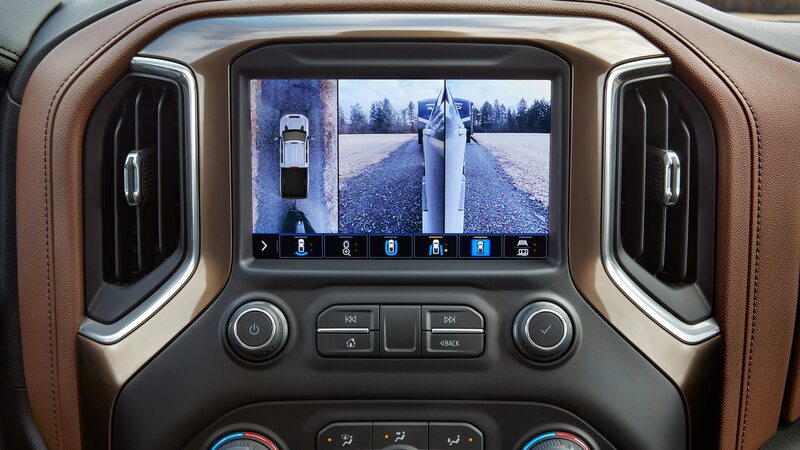 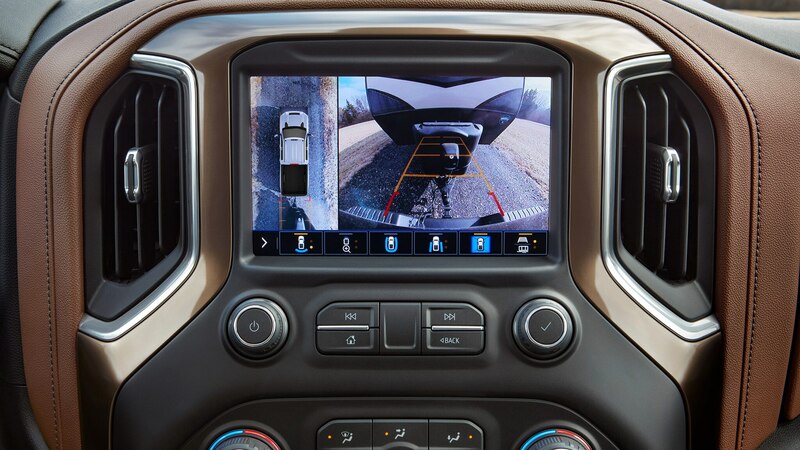 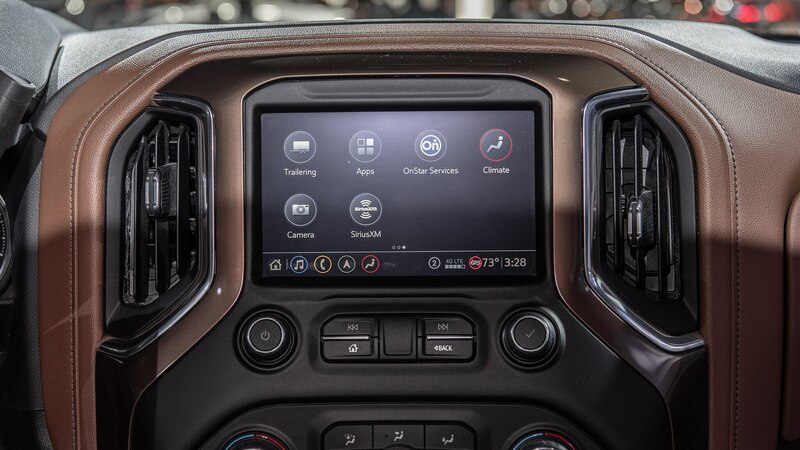 Being a new pickup truck, the ’20 Chevy Silverado HD features the latest advanced camera technology, with eight available cameras offering up to 15 different views. 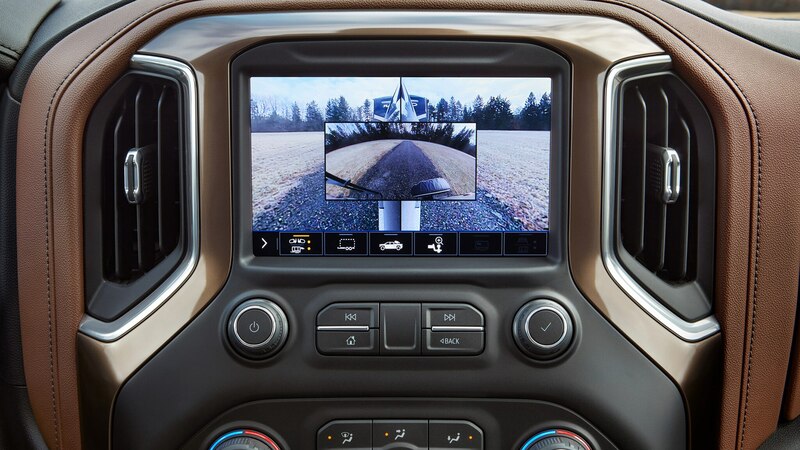 The digital cameras are hard-wired and high-definition, and include a rear side view with turn-signal activated biasing, and a “see-through” feature that allows the driver to virtually “look” through the trailer he or she is towing. 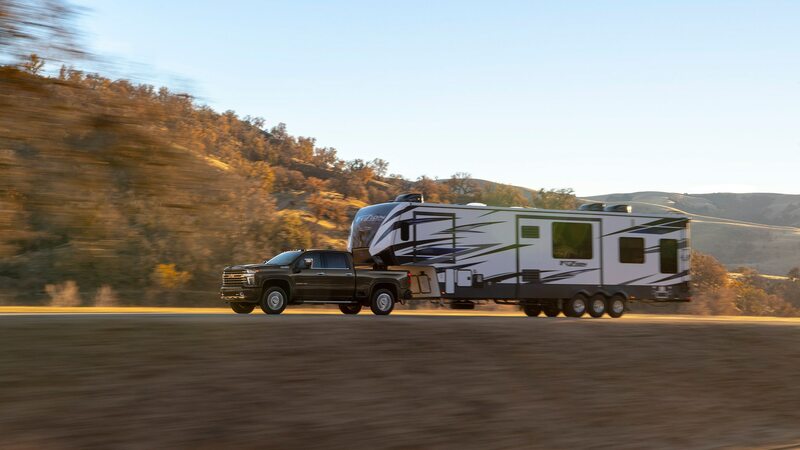 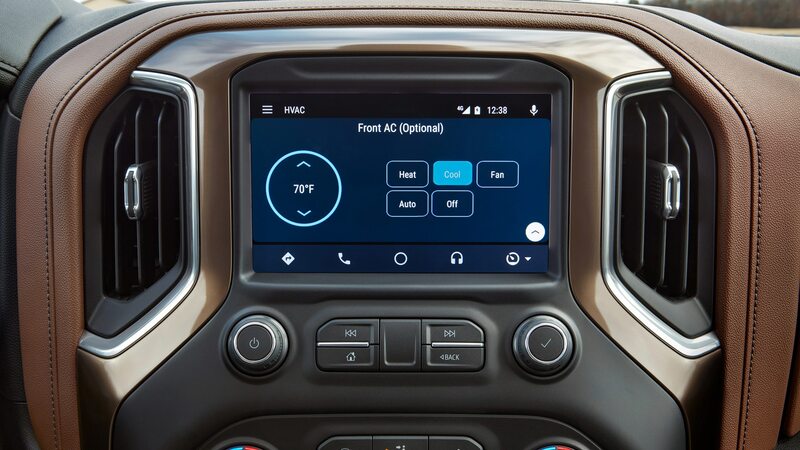 The driver also can use the center screen to check tire pressures and temperatures on the trailer, as well as the truck, and can pre-condition a trailer home’s heating, air-conditioning and water heater. 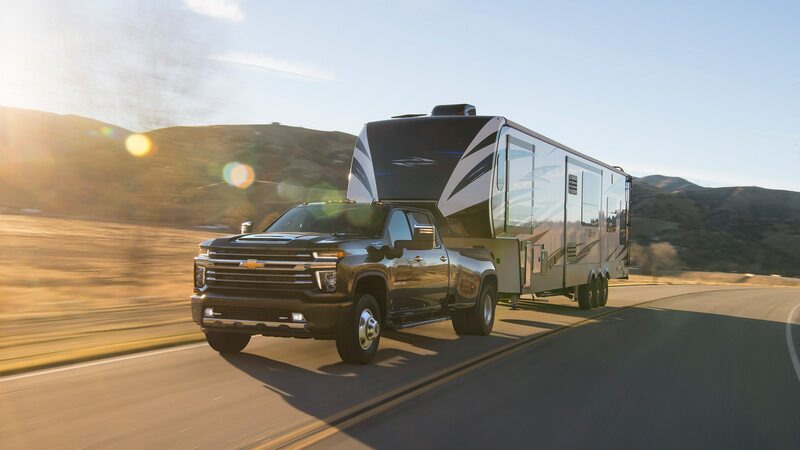 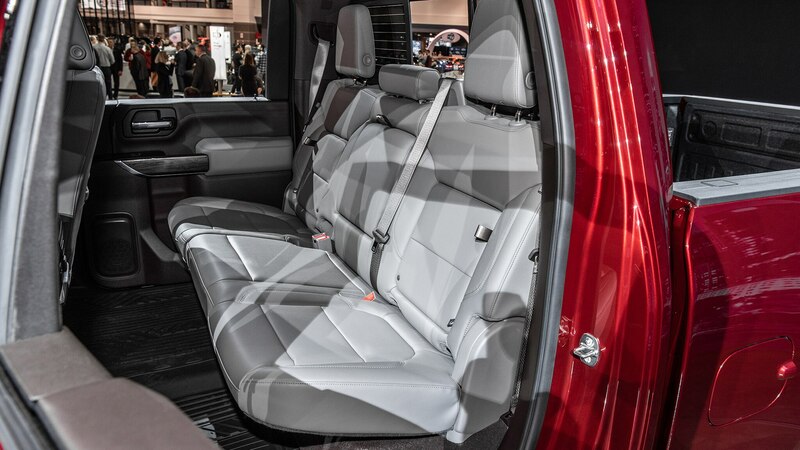 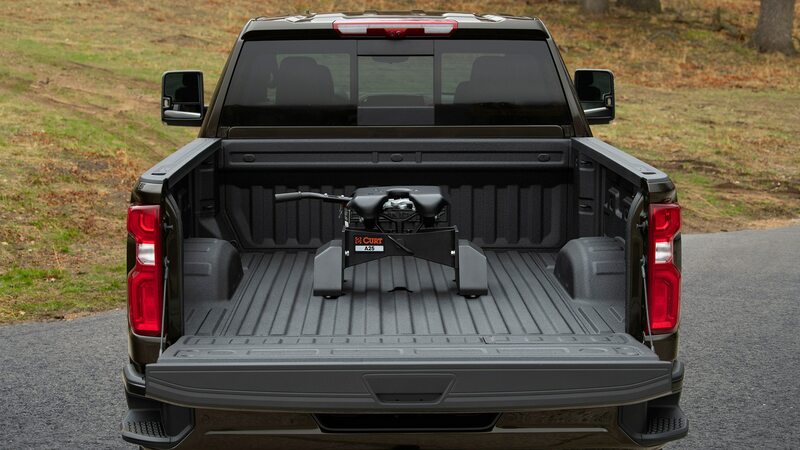 Chevrolet claims the largest cargo volume in the truck’s segment, and the Silverado HDs come with a 120-volt outlet in the bed, a segment-first power up-and-down tailgate, and nine moveable and 12 fixed bed tiedowns. 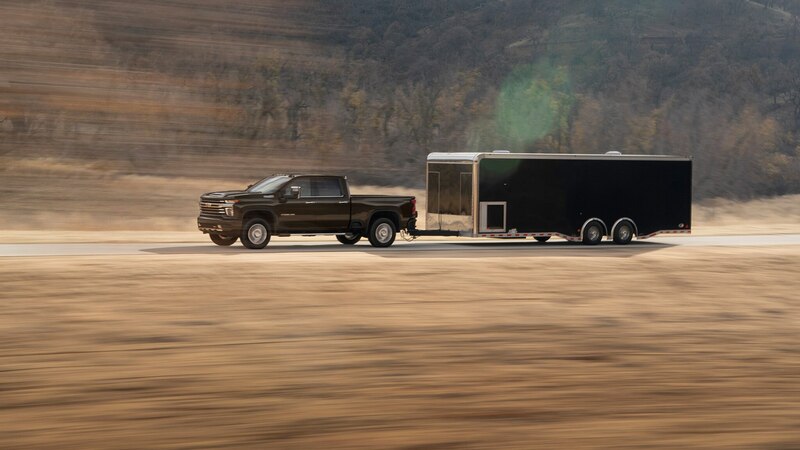 Advanced trailering features include a pre-departure checklist, customizable trailer profiles, and a smart trailer app. 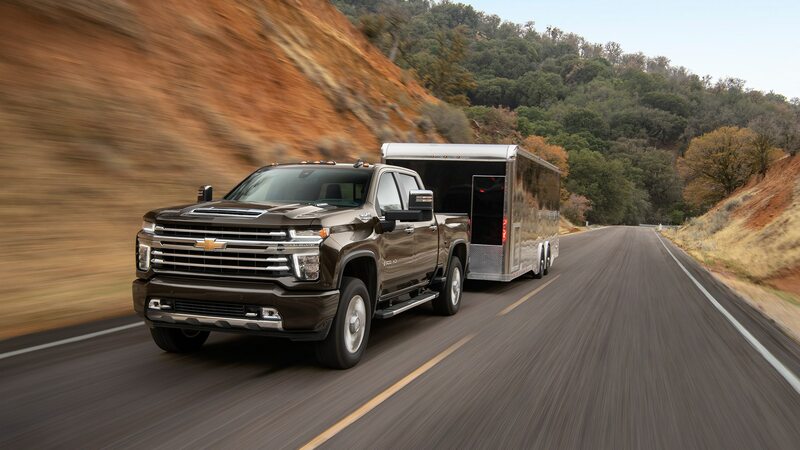 This is the first Silverado HD that doesn’t share its bed with the Silverado 1500. 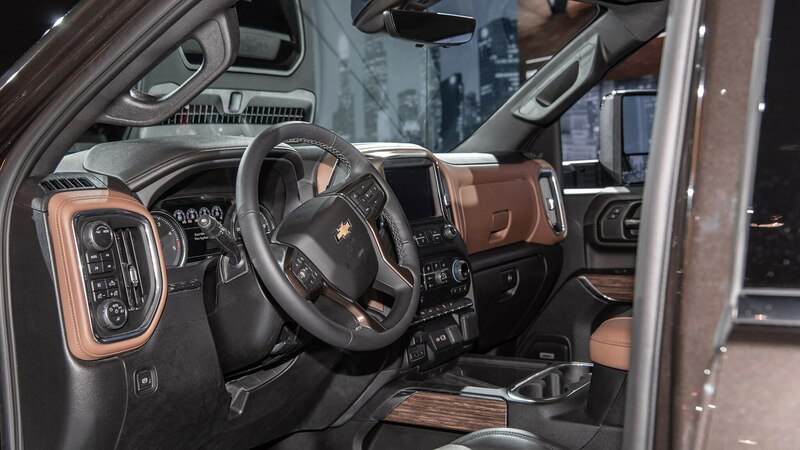 Yes, these gargantuan trucks have all the modern features one could fit inside. 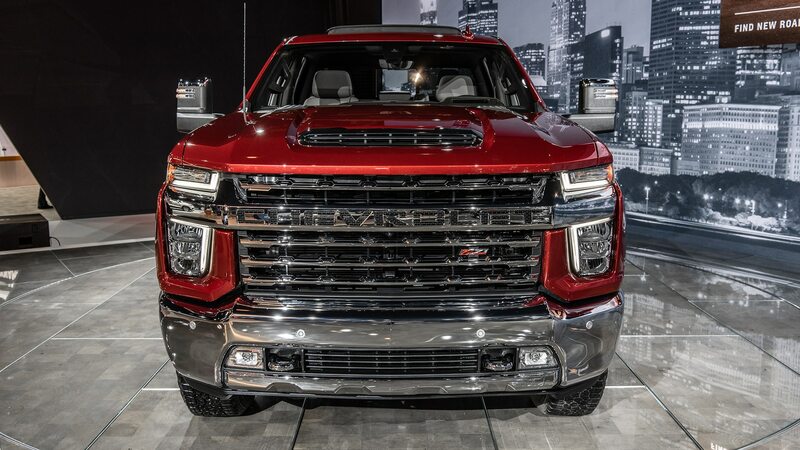 Each Detroit competitor has its own list of best-in-class numbers, and it seems each will continue to leapfrog the others as long as there are companies to build them.